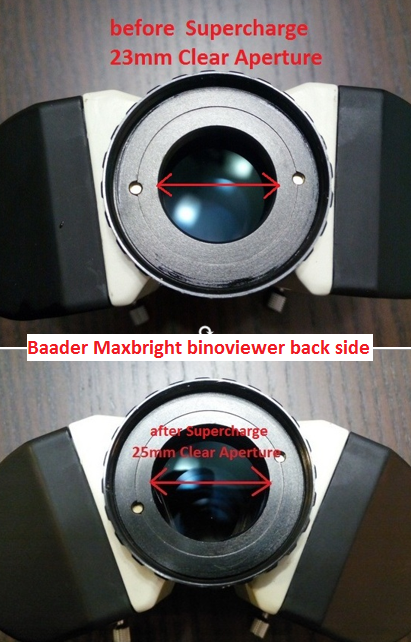 I am only person in world who will offer you Supercharge service of very popular binoviewers like Baader Mark V and Carl Zeiss equal binoviewers! Also, I can do Supercharge on your William Optics, Celestron, Baader Maxbright, Astro-Professional, Telescope Service, Omegon and simillar binos! 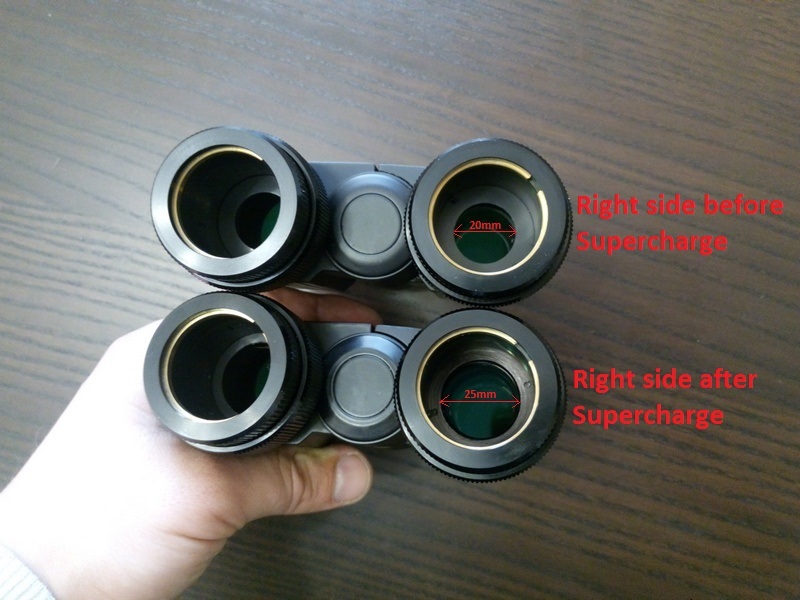 With Supercharge serivice you will definetly increase prformance of your bino, and you absolutely do not loose any of optical performance, so definetly no any additional internal reflections or simillar unwanted stuffs, contrary, you get even LESS internal reflections after my inside blackening of bino and glasses which are not blackened! ---on right eyepiece side there is 28mm Clear Aperture prisms(Supercharged), while originally it is 26mm Clear Aperture (yes, it is originally ONLY 26mm Clear Aperture field stop inside binoviewer, so you do not see it clear when using lets say Panoptic 24mm or ES 24mm 68 deg FOV eyepeices. 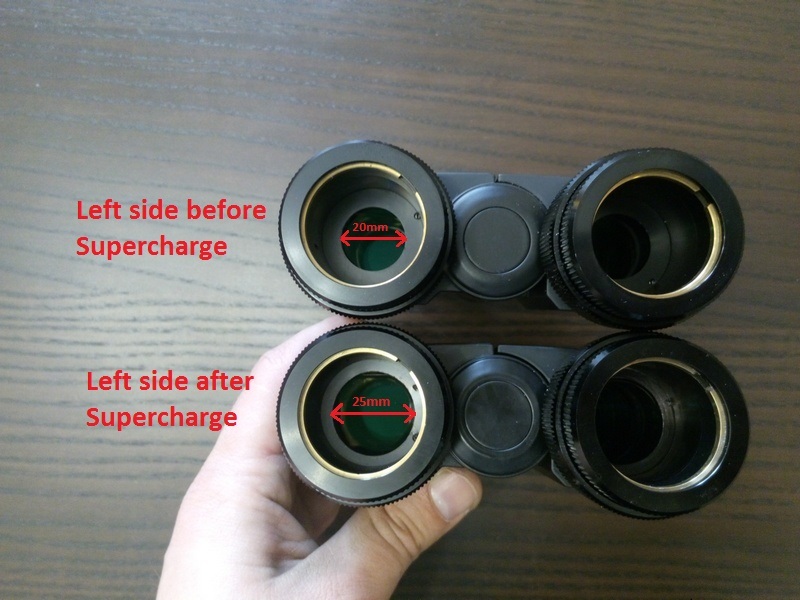 Do simple test: look through back side of binoviewer and cover one eyepeice side with hand, and then quickly change hand to other eyepiece side and repeat it constantly. 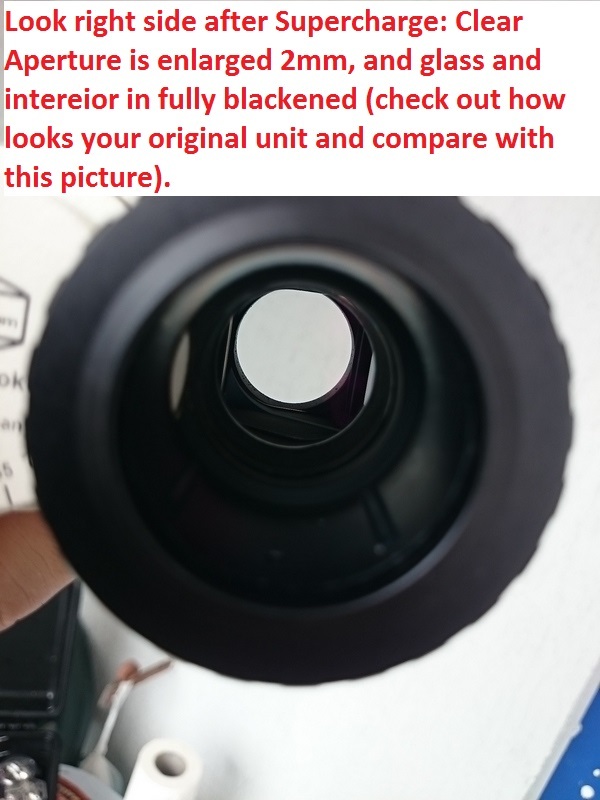 You will clearly see that diameter on left and right side is not equal like Baader specifie 28mm Clear Aperture on all sides). ---on telescope side you have full 30mm Clear Aperture prisms (Supercharged), while originally it is 28mm Clear Aperture. 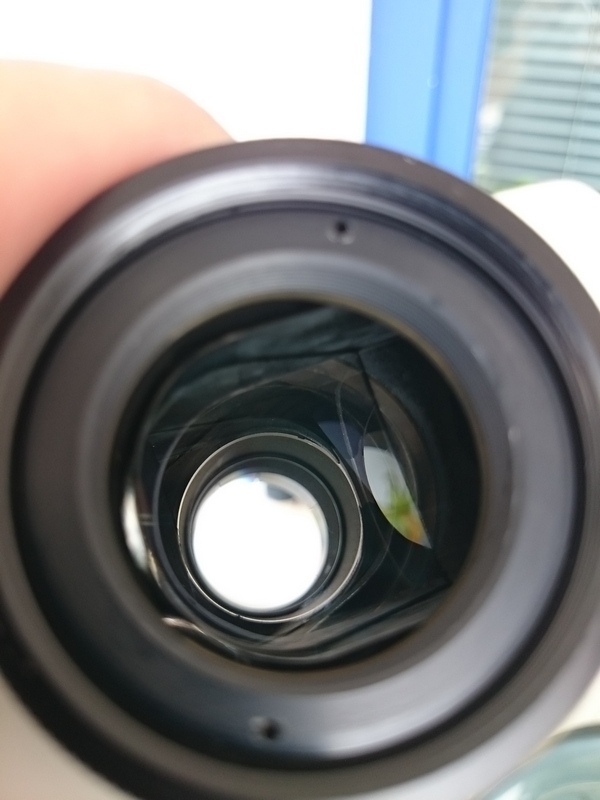 With this, bigger opening on back side, you will be able to collect more precious light from your scope, especially from scopes with fast focal ratios! All this will allow you (when we talk about Mark V and Zeiss like binos) to use Panoptics 24mm (with field stop 27mm), Explore Scientific 24mm 68deg FOV (with field stop 28mm) or simillar eyepieces who have field stop 27mm or 28mm, without any vignetting, and without any blurredd edged in field of view! When we talk about binos like William Optics, Celestron, Baader Maxbright, Astro-Professional, Telescope Service or simillar, you get Clear Apertures from approx 20mm on each eyepiece side, to full 25mm! ---24.5mm to max 25mm Clear Aperture (Supercharged) prisms on telescope side (depending on bino model), instead 23mm Clear Aperture prisms like in original setup. 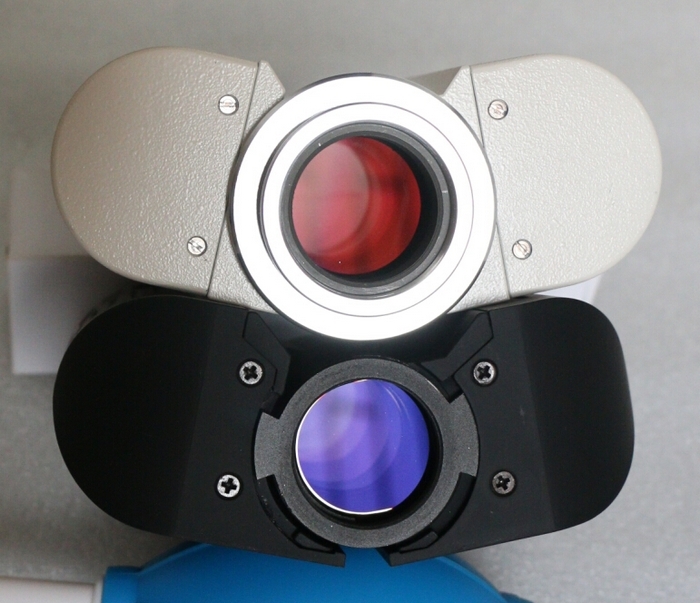 I guarantee about your binoviewers once I get them in my hands, so if someting get wrong, like some broken parts, I get same NEW unit for you all at my costs! Fortunately, this never happned so far! ***FREE repair service if needed in case I can fix issue! "Fantastic experience! I had Denis examine, clean, collimate and supercharge my Mark V and I have to say that he was the ultimate professional. Excellent communication throughout the process, he gave me simple instructions in order to ship the bino, sent me emails and even photographs of each step he made, then promptly shipped it back. The whole process only took a couple of weeks including the shipping. Inexpensive, excellent service and trustworthy. Of course they work great! A far better option than sending these to the manufacturer and spending 3 times as much and wait for weeks for service. Denis also provided me with simple instructions so I can collimate in the future on my own. Absolutely my highest recommendation - 5+++++ Stars!" Each Supercharge Service will cost you 100 USD, and you cover shipping costs to your home adress, which is fully tracked for 20 USD via airmail priority! I do this job with LOTS of love and passion!!! 1) What benefit will Supercharging give me? Larger FOV? Brighter image? Something else? ***You get a bit more precious incoming light, to any of your scopes, especially from faster ones. Also, you can use eyepieces with larger field stops, so it means wider fields of views, and you can use eyepieces with longer focal lengths without any / with less vignetting (depending on bino model). 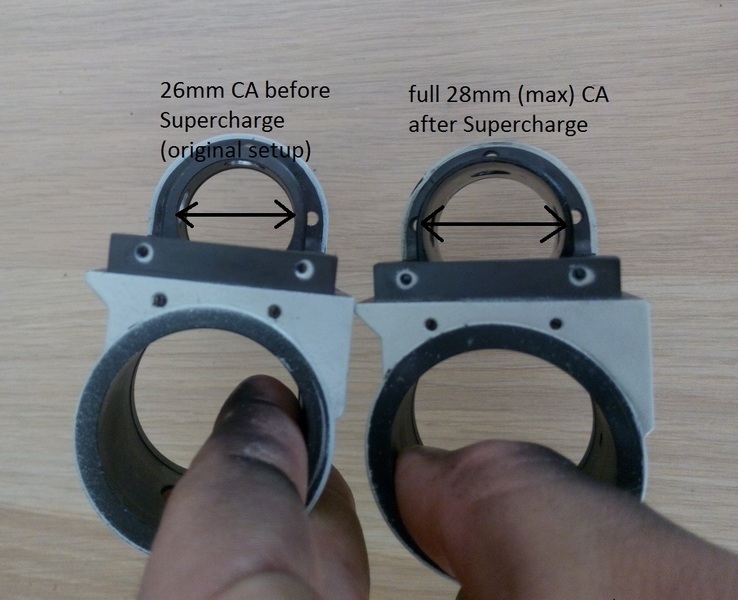 2) Is there any disadvantage to supercharging (standard parts don't fit any more, fixtures less secure, less metal so system is not as strong...etc.etc)? ***Absolutely no disadvantages, everything works perfectly. 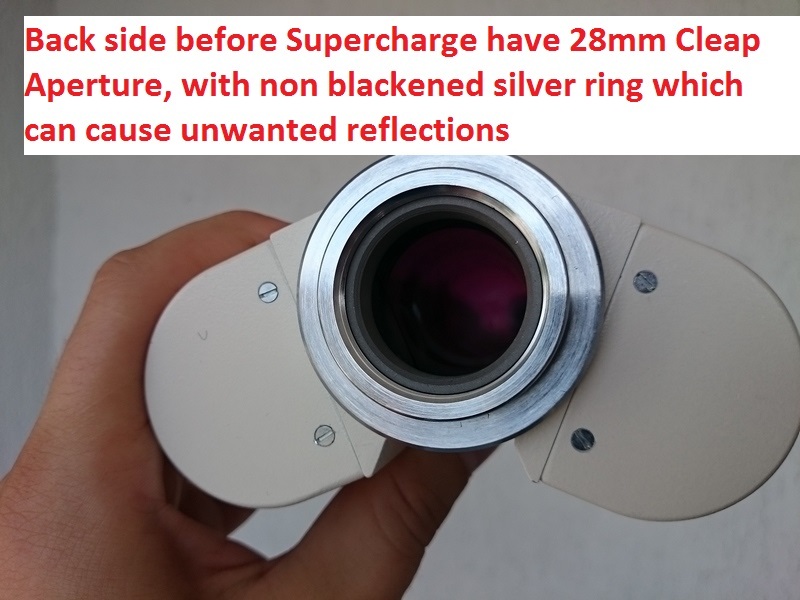 With Supercharge service you will definitely increase performance of your bino, and you absolutely do not loose any of optical or mechanical performance, so definitely no any additional internal reflections or similar unwanted stuff. On the contrary, you get even FEWER internal reflections after my inside blackening of bino and glasses which are not blackened. Mechanically everything is as before, sometimes even sturdier. 3) If you Supercharge, do you re-collimate afterwards (I dropped my bino once, and I think it might need re-collimating anyway)? 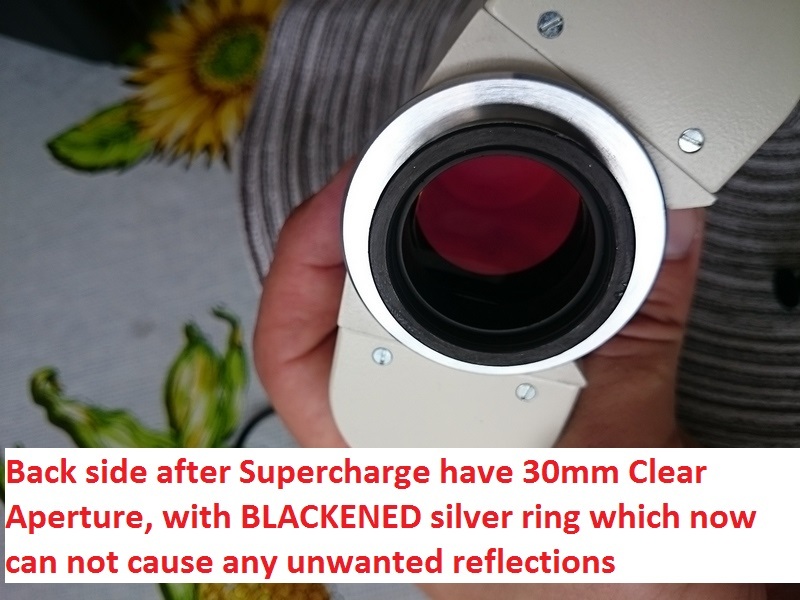 ***Of course I do perfect collimation and cleaning optics after Supercharge all for free, no matter if it is out of collimation before I do Supercharge. 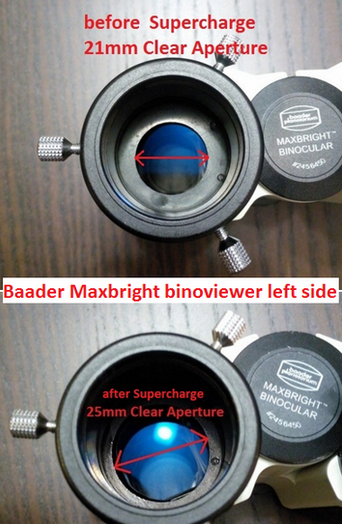 4) Can you do a check up on the Binoviewer as part of the Supercharge (see if I cracked or chipped some optics when I dropped it)? ***Of course I will check all before Supercharge, all for free and will inform you if there are some broken/cracked parts like metal/plastic or optics. 5) What is the cost of this service including shipping back to the US? ***Supercharge is 100 USD only, + 20 USD for shipping back. 6) Do you know roughly what the cost is for shipping the binoviewer to Croatia? ***If you ship bino from USA, using via USPS with low insurance is approx 20 - max 30 USD. 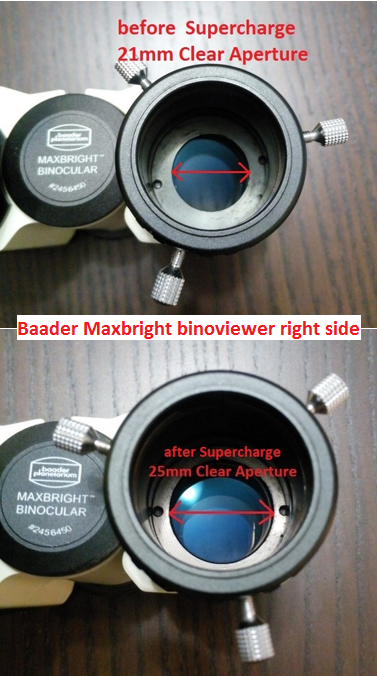 7) How long will it take you to supercharge and then return the binoviewer? ***Once I receive item, Supercharge will take 2-3 days only, so no long waiting times. After that I wait for first clean night to do perfect collimation on stars, and then I ship your packet with bino via airmail priority fully tracked shipping which usually takes 5-10 working days only. Edited by nicknacknock, 20 December 2015 - 10:38 AM. Edited by denis0007dl, 16 September 2015 - 03:20 AM. Edited by denis0007dl, 16 September 2015 - 03:25 AM. Excuse me, but, if the manufacturers do use baffles in their designs, do you think it's for the cheer pleasure of reducing clear aperture for their customers? Edited by alarmclock, 16 September 2015 - 04:46 AM. Excuse me, but, if the manufacturer insert baffles in their designs, do you think it's for the cheer pleasure of reducing clear aperture for their customers? none manufacturer put any baffles inside bino. Almost all these parts I Supercharged, holds glass inside bino in some way, but I use other more usefull methods which holds glass inside bino, as well I add/replace poor and thin screws which holds prisms, with fatter ones, so prisms holding is even much better and sturdier. Edited by denis0007dl, 16 September 2015 - 10:48 AM. Oh, right, so how are those circular metallic things you are enlarging called again? That is a good question, one I've wondered about myself. 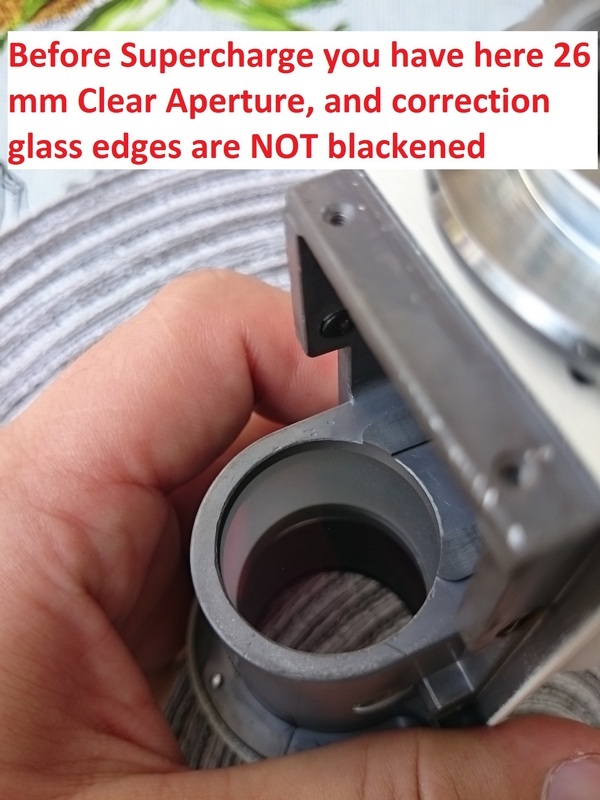 While allowing maximum clear aperture is a good goal, does removing the baffles/stops or reducing their size have the potential to unmask other issues such as scattered light or flaws in the glass of the prism? Ligh incoming from telescope cant go inside bino anywhere else, except beamsplitter. I wouldnt do such stuff if it were unusefull. I am big binoviewers fan, and I know what is best for them, and how to increase their performance. 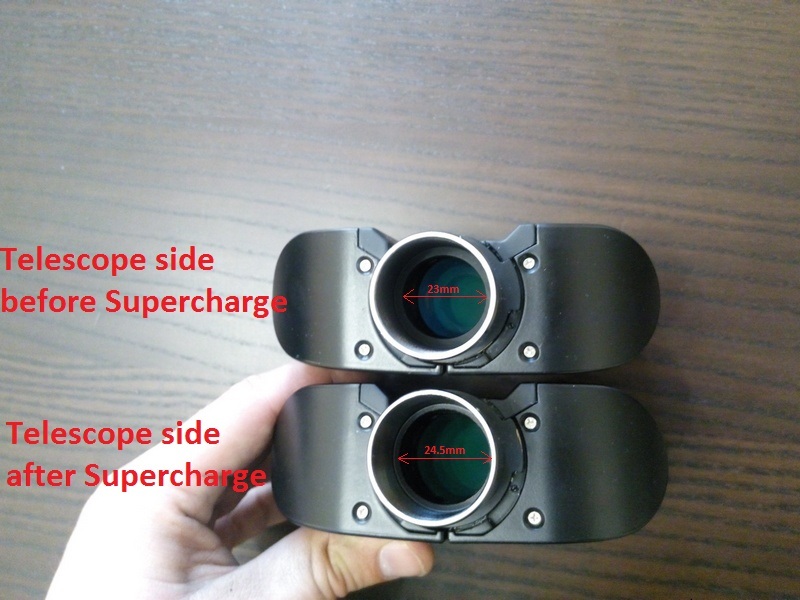 If you look at TeleVue BinoVue back side, you will see lots of space between beamsplitter and bino body, so would this means that BinoVue have tons of unwanted reflections or simillar? NO! What I do, on scope side you have nowhere such gap between beamsplitter and bino body like BinoVue have. Edited by denis0007dl, 17 September 2015 - 10:21 AM. Supercharging is not new. Others do it FYI like Siebert. However, Denis is offering it for a more competitive price. Edited by BillP, 17 September 2015 - 02:31 PM. Supercharging is not new. Others do it FWI like Siebert. However, Denis is offering it for a more competitive price. Here, I want show you back side of TeleVue BinoVue. You can see how much space is between beamsplitter and bino body. This is originally made, and there are no any issues on bino becasue that! Edited by denis0007dl, 17 September 2015 - 11:15 AM. Thanks Denis and I think that might clear some things up for a few people. I've been a bino-aholic now for ~10 years. I'm not seeking a cure or remission either. ...and here, look back side of new Binotron 27. There is also some little space between beamsplitter and bino body. Here, like in BinoVue units, prisms are maximally utilized! While this is not present in Mark V and Zeiss like units, as well in Baader Maxbright, WO and simillar binos, I offer to make oppenings to be bigger, as maximum prisms allow. But I do not do this only on telescope side, but also in all other sides of bino, ans well inside bino. 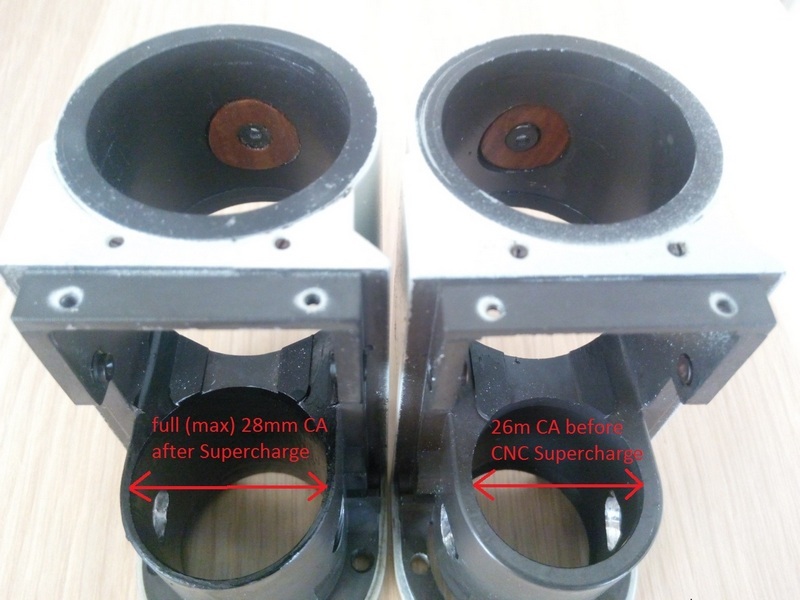 ...here you can see how looks like interior of Mark V bino before and after Supercharge....after Supercharge, now, I do complete blackening all parts inside bino. Also, correcting glass hold in just one point in original setup, and I do three points where this glass is more secure inside bino! There are tottaly 4 places where I extends apertures in such units! Edited by alarmclock, 17 September 2015 - 02:08 PM. I am not only one, and not first person who do this service. All necessary is described, and I am sorry if you cant find this to be usefull. Seems you have more experience than I do, and that you know something I dont. get special price of 90 USD only, instead 199 USD!!! I suppose that the supercharging in no way adds to the light path length of the binos correct? Thats right, no additional light path. Light path stays as it was before. 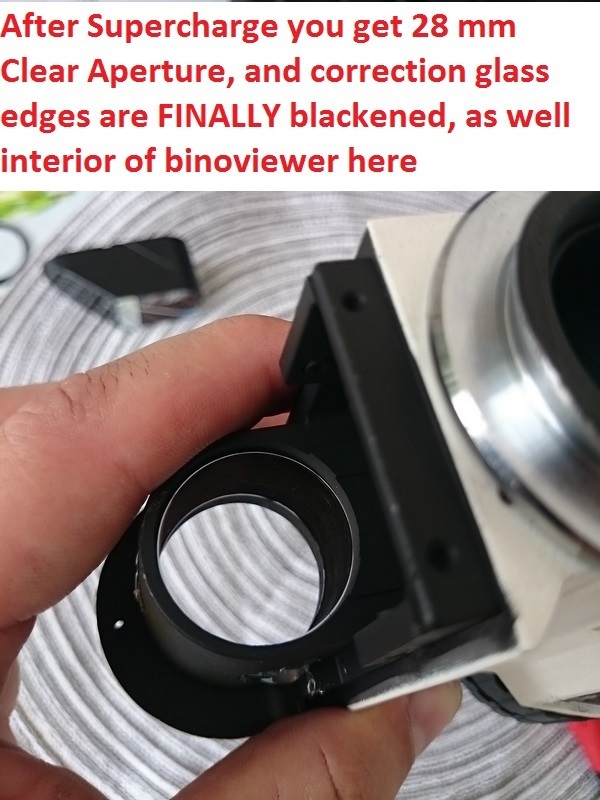 Denis, is there something you could do to a Baader Maxbright binoviewer to replace the rotating eyepiece holder with the three set-screws by something equally (or more) functional but not having those annoying set-screws? Yes I can, but it do not worth to make for Maxbright, because it would costs more than whole new bino unit!